I dread going to IKEA. Not because of what they sell (which is great), but because of the crowds. I get more stressed going to IKEA than training outdoors during a heatwave. To be honest, IKEA in New York (Brooklyn) is a great store, located in an awesome spot on the riverfront. Clients can enjoy a magnificent view of the City while shopping. Plus there’s a complimentary water taxi service that takes you from Manhattan’s Pier 11 directly to IKEA. Nice. However, I still don’t find going there to be a pleasant experience. Maybe when I’m older I will, just not today. There’s one thing I do love at IKEA though: the meatballs. Even people who don't know much about Swedish food will probably at least have heard of, or tried, the great dish that is IKEA Swedish meatballs (especially since IKEA took over the world). I love so much those little balls of meaty goodness that one time I actually went to IKEA just to have them for lunch. It was a long time ago, when I still had a lot of time on my hands. But I did. However, as much as I love IKEA meatballs, I always knew I could replicate them at home, using better ingredients. And you know what? I did, yesterday. I also made them egg-free and gluten-free. How about that? These copycat meatballs are so easy to make, it’s not worth driving anymore to IKEA to buy the frozen packs. Unless you’re going to buy furniture, then it’s a whole different story. 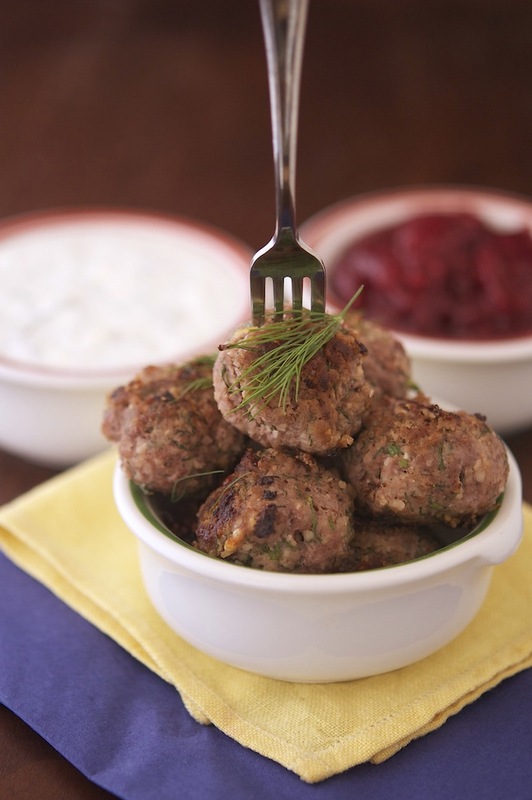 Make these meatballs (and the lemon-dill sauce) and pair them with mash potatoes and some lingonberry sauce; there you have it: a perfect meal. Tasty, comforting, low carb and gluten-free. If you’ve got a load of friends coming for dinner, you could make two batches of these and let everyone help themselves. Success. 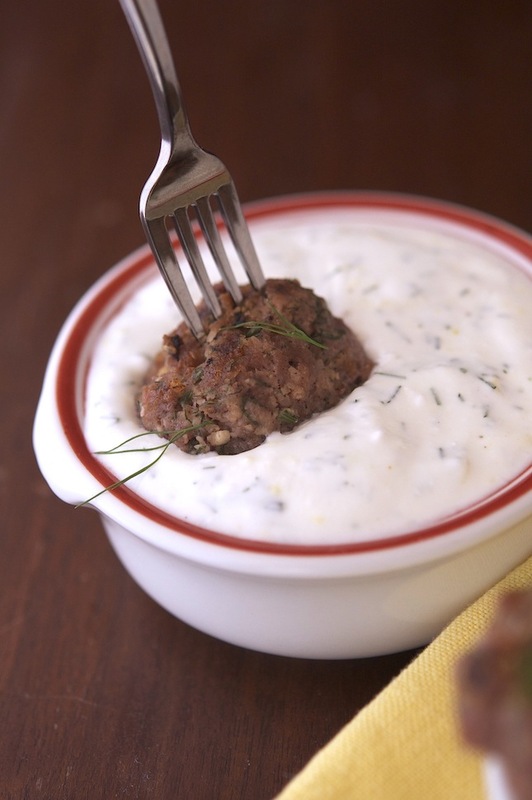 “IKEA” Swedish Meatballs with Lemon-Dill Sauce Print this recipe! In a large bowl mix well dill, pork, beef, milk, almond flour, allspice, salt and pepper. 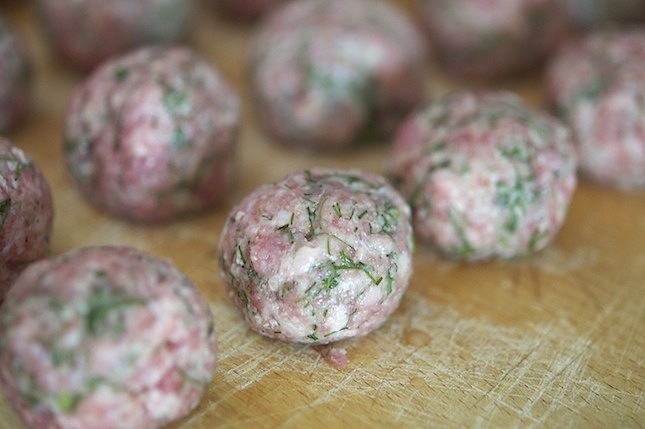 Scoop one scant tablespoon of mixture and with dampened hands roll into meatballs (keep wetting as you go you get nice meatballs). If you have time, put the meatballs on a large oiled tray, cover with plastic wrap and pop in the fridge for 1 hour to firm up. If you don’t have time (like myself) you can cook the meatballs right away. Heat one tablespoon of olive oil in the largest pan you have over medium heat. 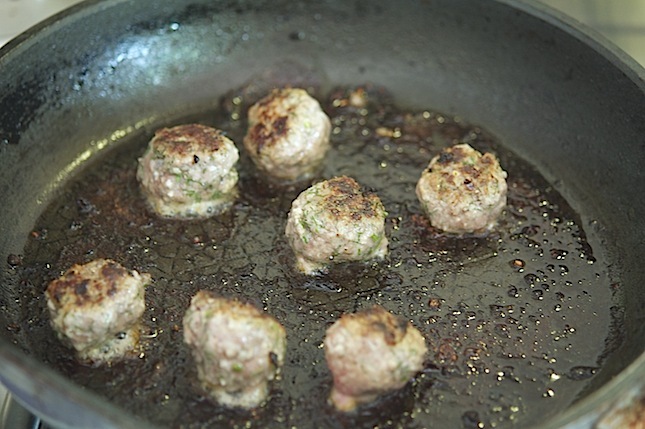 Once hot, cook meatballs - in batches - for about 8 to 10 minutes, tossing gently occasionally until they are golden brown. In the meantime make the lemon-dill sauce. In a bowl whisk together all the ingredients until smooth. 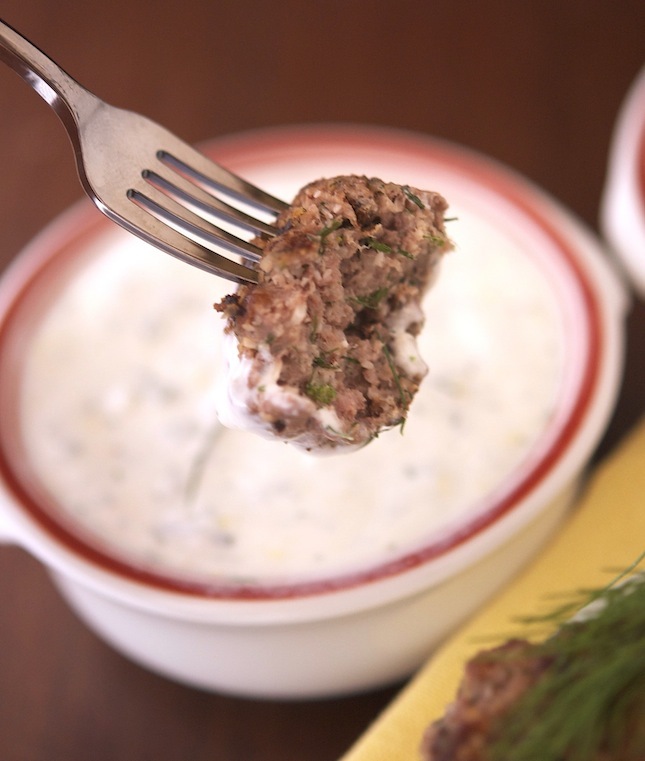 Serve your meatballs topped with a bit of chopped dill and lemon-dill sauce on the side. If you want to get the full Swedish experience also add a spoonful of Lingonberry jam on the side and serve over mashed potatoes. One “naked” meatball yields 45 calories, 2.5 grams of fat, 0.5 grams of carbs and 4 grams of protein. One “dressed” meatball yields 51.3 calories, 2.8 grams of fat, 0.76 grams of carbs and 4.6 grams of protein. I love Ikea's meatballs as much as I do love shopping there, but I do understand that it's not really a guys' thing! OK, I'll try to replicate the Almondy (although I feel you'll be better at it) but only if you promise that next time my GF wants to go to IKEA, you're going with her: deal? Oh my! You like to live dangerously, don't you? And when I sink my teeth into the sinful treat, I'll have to blame you for it! One word of advice: DON'T! You'll curse me forever, as you will undoubtedly get cravings for this dreamy dessert. I do agree with Sonia Ikea's Almondy is to die for. Can you please work on it? 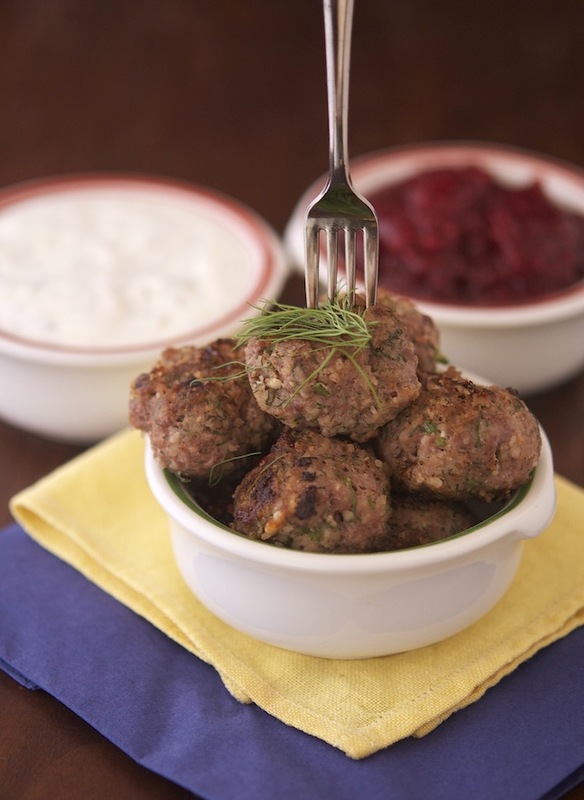 These meatballs are amazing. Since I don't eat beef and pork, I tried made them with ground lamb. I also didn't have fresh dill, so substituted with fresh cilantro. They were so delicious. I finished off 1 lb of meatballs all by myself. It is a brilliant idea to use almond flour and whole milk. Never missed egg and bread crumbs. So happy you like them Madhu, and the lamb+cilantro combo sounds amazing. Gonna have to try it! Is that a half cup of almond meal?